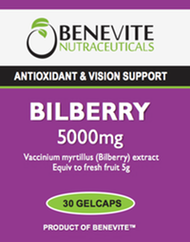 BENEVITE NUTRACEUTICALS™ Acai Berry contains Acai Berry and Ganoderma Lucidum (Reishi), which are potent antioxidant herbs, along with the goodness of Cassia tora, Coix lacryma-jobi, Citrus Aurantium and Evening Primrose Oil. 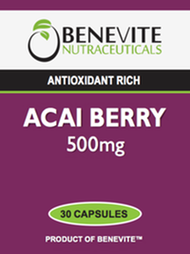 BENEVITE NUTRACEUTICALS™ Acai Berry is a nutrient dense food that provides a feeling of fullness. Adults: Take 1-2 capsule daily with meals, or as directed by your healthcare professional. Soya oil, Gelatin, Cassia Tora Seed Powder 143mg, Glycerol, Coix lacryma-jobi Seed Powder 104mg, Evening Primrose Oil 65mg, Hydrogenated Coconut Oil, Acai Berry Extract 48mg (equivalent to dry fruit 240mg), Purified Water, Lecithin, Beeswax, Citrus Aurantium Fruit Extract 2.9mg (equiv to fresh fruit 72mg), Ganoderma Lucidum Extract 2.6mg (equiv to dry whole plant 26mg), Titanium Dioxide, Colours (171, 133, 172, 129).